Time,Time..I have all the time --: Mother's Day Magic!!! Thoughts and images of my mother keep popping up in my mind every day in one way or other, and I am sure we all share this experience about people whom we love or loved very much. Many a time I have imaginary conversations with my mother, my father and other people whom I really love as though they were right there in front of me. Being bombarded by the print media, electronic media, social media by the myriad advertisements about Mother's day, I feel sad as nowadays I don't have much to write about my mother. It is not that there is really nothing to write, but still I could not think of writing / sharing anything about her here in my blogs. It has been 3 years to the day since I last wrote about her on Mother's day. I was cooking as usual, making Rasam (a watery soup like dish), and some potato curry to go along with it. The aroma of tamarind, the rasam powder, the tomatoes along with curry leaves boiling started wafting throughout the house, which is not unusual. But today the aroma was a little different and special : it was the same aroma that I used to get whenever my mother made Rasam in our home ! I have been making Rasams for so many years, and it would always taste good. But only on rare occasions did I manage to replicate the aroma brought out by my mother's magical Rasam. 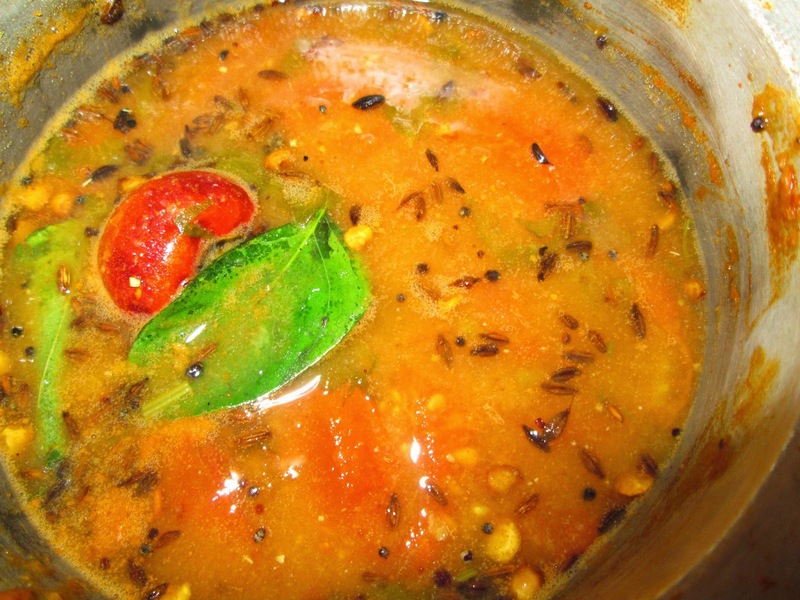 At that moment, I would get so excited and shout out to the whole family that " today the Rasam smells just like Patti's (grandma's) Rasam and also tastes just like hers". I would dramatise it so much, that my children in the innocence of the very young would really believe that they were indeed tasting the best Rasam made especially for them by their grandma. My mother would also invariably make an accompaniment for her heavenly Rasam - boiled potatoes coated with thinly sliced, finely chopped onions fried together so that the potatoes get a coat of the brown, self caramelised onions. With no deliberate intent and by sheer coincidence, I made this type of Potato curry and Rasam today on Mother's day! And not just that : today my mother seemed to be by my side throughout, guiding me, tutoring me to create the utterly heavenly, delicious tasting Rasam and Potato curry. "Magic exists. Who can doubt it, when there are rainbows and wild flowers, the music of winds and the silence of the stars? It is such a simple yet an extraordinary part of the lives we live". I find no words in my dictionary to describe the aroma or the taste of the Rasam and potato curry that my mother (my mother's soul) and I made today. 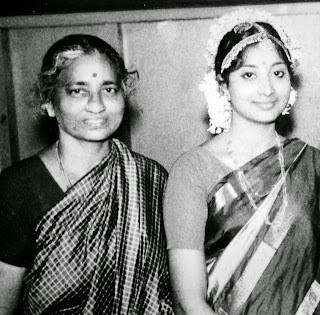 Thank you Amma, for being with me even when you are no longer here in this world : a magic that only mothers can accomplish! Let there be some magic in your day too! Making rasam and alu curry in the same manner with same flavour as she did is a nice way of remembering her on this thought-filled mother's day. Yes, KP, it happens only rarely, and whenever it happens i can feel my mother with me. Do you remember your mother, and do have some interesting story about her, then please do write you are such a good writer. We are all inspired by your writings. a beautiful article made me nostalgic ..
Bikram thanks a lot. I am still not able to post comments on your blog, wordpress would not take any of the password , and would not let me sign in. I wish you had not left blogger. So true, Mother's cooking is always the best! Great post and the Rasam and potatoe curry sound delicious. Great photo too! I am sure you may not have ever tasted these dishes, but believe me, they are super dishes. Thanks for liking the pictures and the Rasam & Potato story. Mothers are special. They are guardian angels sent by God to take care of the children. Yesterday, I attended the Sunday mass and the priest in his sermon talked about his mother. He said that after school he would run home in the evening to eat something because he was hungry and he always got some rice to eat. This went on for years and only when he grew up he understood that his mother did not eat her rice in the afternoon and starved so that he could eat her rice in the evening. This is the kind of sacrifice that mothers make. 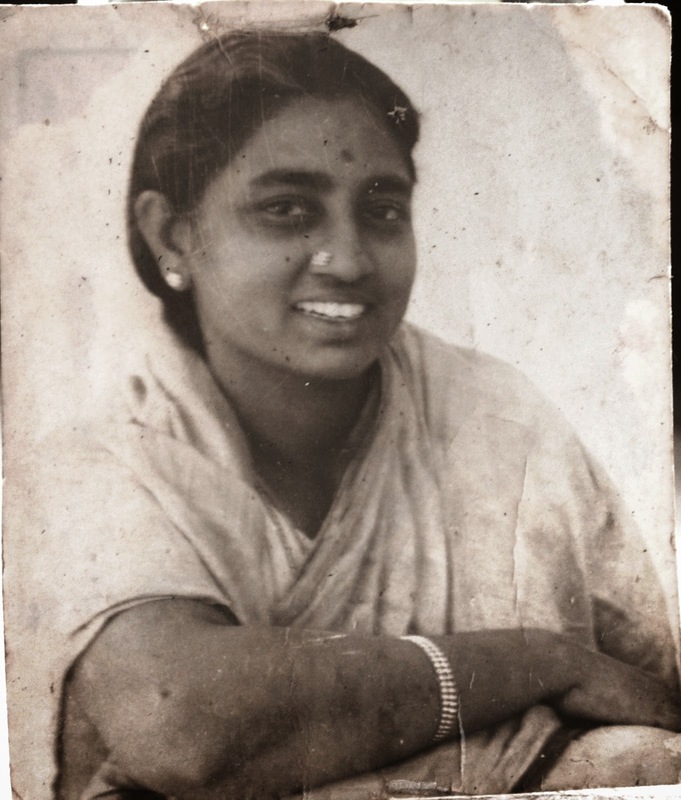 My mother slogged all her life, day in day out, without much talking to make sure that all of us got things to eat in time, clothes to wear and myriad other things that we needed. I very rarely saw her getting angry and she calmly put up with all our mischief. When I moved out of the house she was always a role model for me. I always picture her as someone who worked tirelessly without expecting anything in return. :Lovely photos of rasam and aloo which you learned from your mother but as you said your mother's rasam was better. God bless you mother and all mothers all over the world. You mother has a lovely smile. I think the photo with both of you was taken at the time of your wedding. You look very sweet, happy and charming like a movie star. I am so happy to hear you say so many nice things about your mother, and your gratitude for all the comforts she managed to give you. Some mothers are so good , one can never ever forget them. Thanks for all the compliments, it really feels so good to hear them. Unfortunately the cameras of those days were not so easy to handle, so the pictures taken were very few. I regret not having many pictures of my mother. Yes t was taken during my wedding. Very touching write up that brought tears to my eyes, So glad you are able to enjoy your mother's memory till today. And you make the simplest dish look most attractive and appetizing! Thanks padmaja, I am sure you too must have had such feelings for your mother, when you were away from her. Very true. When someone is close to your heart, the person keeps coming back at the most unexpected times, a smell a sound anything can trigger it off. 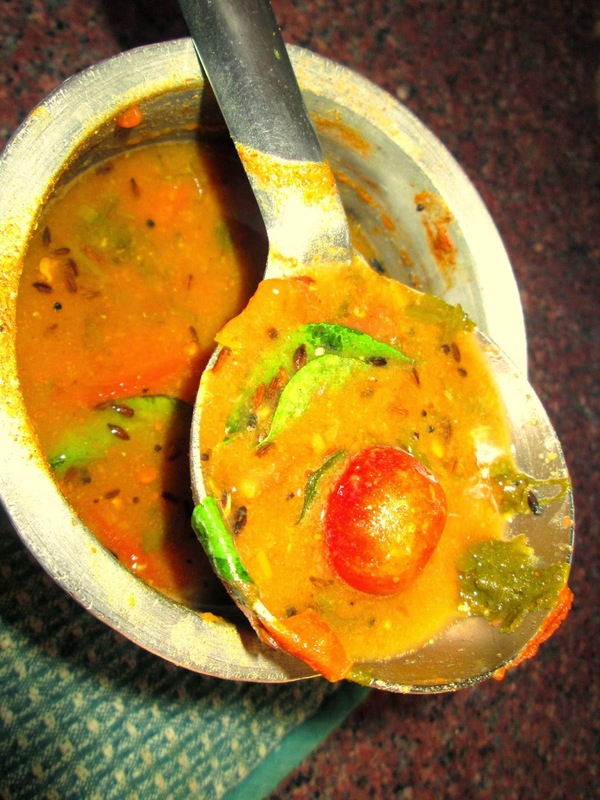 By the way Rasam is one of my favuorite too. A loving mother is the heavenly gift for children, for now a days mothers love their wards achievements only. 94 Years Old: Happy Birthday Dear Father!!! !